About a week ago, the entire Internet was discussing whether a certain dress was white and gold or black and blue. Everyone was talking about it so this was a perfect situation to use for real-time marketing purposes. That’s exactly what the Salvation Army in South Africa did today with this tweet below, and boy did they nail it with this one! The advert is part of the Salvation Army’s latest anti-domestic violence campaign. The web has been buzzing the last few days about Kim Kardashian’s rear end after it appeared on the cover of Paper magazine’s winter issue. Not surprisingly, some brands jumped on the bandwagon trying to not be left behind in the discussion. The practice of real-time marketing is a difficult one, but one brand that really got to the bottom of the issue sent out a tweet to end the discussion. Here’s Nissan’s first Twitter rear-time marketing effort. Touché Nissan, or should I say, tush? Ever since Oreo tweeted that clever “You can still dunk in the dark” tweet during the Super Bowl power outage, brands have been looking at ways to capitalize on current news stories in social media. Most of them have failed, some miserably. Real time marketing is apparently a tactic that includes a high level of risk. Sometimes though, organizations do manage link their brands to breaking stories in a positive way, like with this brilliant video from Schwan-STABILO, the German manufacturer of for example Stabilo Boss highlighter pens. 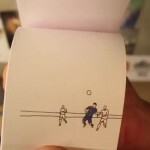 During the already classic 2014 FIFA World Cup game between reigning champions Spain and the Netherlands, Dutch forward Robin van Persie scored a wonderful diving header to level the score 1-1. The Netherlands turned the game around and beat Spain 5-1 in spectacular manner. This conversation on Twitter by Sainsbury’s and a customer may be one of the funniest and best Twitter responses by a brand in a long time. In a recent survey published in Britain’s premier consumer magazine, Which?, budget airline Ryanair was voted last among 100 top brands in quality of customer service. Perhaps the airline is finally starting to realize that it needs to improve its awful reputation in order to remain competitive and make an effort not to “unnecessarily piss people off”. 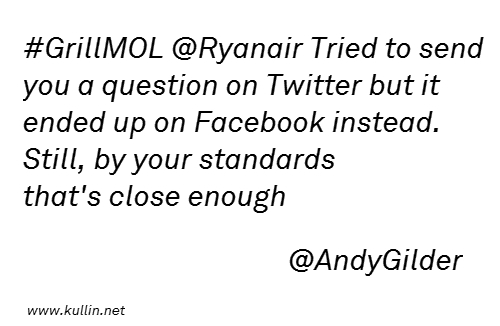 But if Ryanair thought a Q&A session on Twitter with CEO Michael O’Leary would do any good, they failed miserably. The thing with inviting customers to a public debate is that you will not always get the responses you wish. We’ve seen a number of cases where critics have hijacked hashtags on Twitter because it’s a great opportunity to get exposure for your complaints. In a case with a brand that so many people hate, you would obviously expect that critics would take advantage of the situation. People who would otherwise have been silent, now feel there’s an excuse to voice their opinions. A brand in trouble could make use of social media if their intent is genuine, if they are really there to listen and be prepared to change. If you open up a dialogue with critics just to mock them, prepare for disaster. 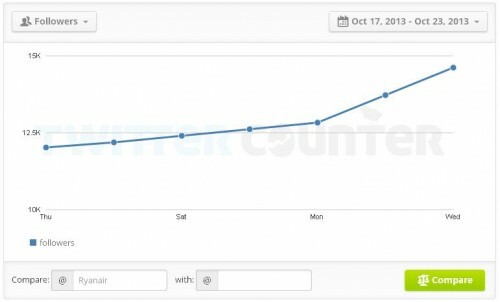 However, as is often the case, even bad publicity will get you attention and the @Ryanair Twitter account has gained nearly 2,000 new followers in the next two days. Perhaps this could be the start of something new, after all. But until the company changes its approach to customer service and to its own employees, I will not fly with Ryanair. It is not uncommon that brands suffer serious backlashes on social networks for controversial or offensive campaigns, tweets or Facebook posts. Sometimes the damage to the brand is minimal, but a local issue can quickly damage a global brand. Here’s one fresh example from Subaru in Dubai. Last Thursday, four people were killed in a car crash on the Shaikh Zayed Road in Dubai, among them a nine-month-old baby. The driver reportedly stopped in the middle of the road due to a flat tire instead of pulling over to a safer place on the side of the road. Another vehicle smashed into the car killing four people. 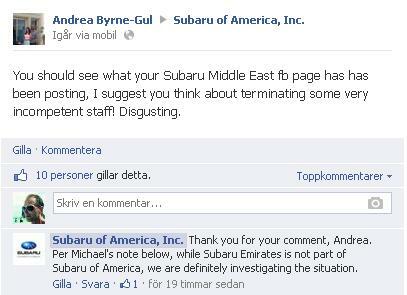 In an attempt to use the incident in its marketing, Subaru Emirates in Abu Dhabi posted a status update on its Facebook page with the following message. “Women driver at it again. An entire family has perished as a result of a grave mistake by a lady driver on SZR this weekend. A Jordanian woman parked her car right in the middle of the road on Sheikh Zayed motorway after it suffered from a tyre puncture. She ignored the driver’s warning to take her car off the road and fix the tyre on the hard shoulder area. Unfortunately a driver who was passing through that area had warned the woman to instantly take her car off the road but that she did not listen. Call it her ignorance, 4 innocent soul paid with their life including a 9-month-old baby boy. Another woman in the car was said to be seriously wounded. A recent post on our Facebook Page offended the sentiments of a number of people. Our sincere apology goes out to everyone for this. We respect your sentiments and have taken down the post with immediate effect. At Subaru, SAFETY IS OUR TOPMOST PRIORITY AND CONCERN. The news posted yesterday was intended as a general awareness message. Sometimes with the best of intentions a final communication may come out wrong. This was one such instance. We just want to bring to everyone’s notice to please be more cautious while driving. But the social media blunder dit not only hurt the brand locally, comments soon flooded the US Subaru brand page on Facebook were several people reposted the offensive post, forcing Subaru of America to respond and take action. This case shows how important it is to respond to social media crises quickly and in a manner that doesn’t initiate further criticism. If you don’t, there is a real risk that the issue will spread more widely. It also goes to show that the concept of using current news stories for brand marketing easily can backfire.